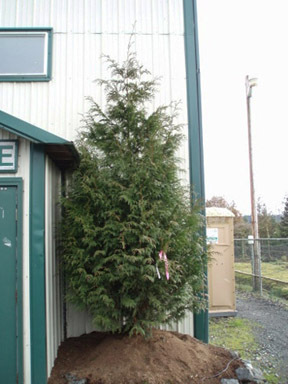 One of the best trees to plant for privacy is the coniferous Excelsa Cedar (Thuja plicata Excelsa). The Excelsa is the smaller of two species of Thuja plicata. It is also known as the Excelsa Western red cedar. The word “Thuja” comes from Medieval Latin and means cedar (thuia). The Greek word ‘plicata’ means folded in plates, which is in reference to the tree’s leaves. Thuja plicata trees are also referred to as Pacific red cedar. Thuja plicata trees are members of the genus Thuja L and the cypress family Cupressacaeae. The four other members of the Thuja L genus are Thuja koralensis, Thuja occidentalis, Thuja standishii and Thuja sutchuenensis. However, Thjua plicata is the only member of the Thuja L genus that is native to the Pacific Northwest. They can live a considerable length of time and are very resistant to decay and urban pollution. An official symbol of British Columbia, the Thuja plicata has a long history of use amongst indigenous people. The tree’s wood, which can be split without cutting, was crafted into canoes, instruments, ceremonial artifacts, totem poles, housing and clothing. Other parts of the tree were used for clothing, making rope and baskets. Despite its name, the Excelsa cedar is not a traditional cedar. Real cedars are members of the genus Cedrus and the Pinaceae plant family. They can grow over 180 feet tall, and are known for their scented wood, which is a natural moth repellent, and cracked bark. The Cedar’s needle leaves, which are green all year round, are arranged in spiral-like clusters. The tree’s barrel shaped seed cones can grow as long as 12 centimeters. They are a native tree of the Himalayas and Mediterranean. In addition to North America, they are also cultivated in Europe, Australia and New Zealand. The Excelsa Cedar can be found from Alaska to California. It is a bushy fast growing tree with a pyramid shape that matures to approximately 30 feet in height and 15-20 feet in width. The tree grows in forests (including forested swamps) and on the sides of mountains. The leaves of the Excelsa Cedar are like scales, and form flat sprays. The cones are much smaller than a regular cedar, growing approximately 10-18 millimeters long. The tree has a very pleasant smell that some people say is reminiscent of crushed pineapple. The Excelsa Cedar is frequently planted when a windbreaker, sound barrier or two-story screen is needed. Or, when a homeowner wants an “instant privacy screen.” They can grow 2-3’ in a year, even in the first year they’ve been planted! They remain green all year long, easily adapt to changing weather conditions, and grow in either full sun or partial shade. An Excelsa can also withstand droughts. When used for screening, the Excelsa can be left to grow naturally, or shaped with pruning. If you have an area of your home or building that you would like to screen, have your site evaluated by a big tree expert. While one or more Excelsa Cedars may be the best choice for your particular project, a knowledgeable professional can discuss all of your options. There are many factors to take into consideration when creating a natural screen. Consulting someone with extensive big tree experience will ensure you make the best decision possible regarding your property.